A leaking roof can be disastrous in the extreme, but even a minor leak is annoying and can cause water damage. The average age of a shingle roof is about 20 years, depending on the quality of the original shingles, the installation, geographical location, and the severity of weather to which the roof has been subjected. The most common problems with shingle roofs can be attributed to old age and weathering, or physical damage caused by buildup of ice, extreme winds, or direct impact to the roofing surface. How do you fix the most common roof problems on shingle roofs? It is essential to identify warning signs of a failing shingle roof as early as possible, and it is good property management to effect necessary repairs before major water damage occurs. The most obvious problem is that when the leaking roof is discovered, it's already late in the game and immediate action is required. At time that is a difficult question to answer. If your shingle roof has major leaks, they must be addressed immediately to avoid serious water damage, but minor leaks can be difficult to find. Tracing is essential to determine the exact source. Inspection of the underside of the roof is elemental in discovering leaks occurring further up the slope of the roof. When tracing leaks to the source, consider the following solutions for each type of problem discovered. Save yourself some aggravation though, always look for the obvious first. Look for the obvious. If shingles are broken off or missing, they need to be replaced. Shingles are broken by flying debris, careless access and walking on the roof, or may be torn away by wind, snow, or ice. Replace missing shingles by removing nails, filling nail holes with roofing cement, and installing new shingles. Lift adjacent shingles with a thin pry tool to avoid breakage, and remove the nails. Remove all broken shingle remnants, fill nail holes, replace the shingles as required, and cement down all tabs firmly with roofing cement. For persistent, difficult leaks, look for staining and darkening on the underside of roof sheeting. Dark discoloration suggests the roof has been leaking for a long period of time and may indicate decay. Check darkened areas by testing the wood with a pen knife. With advanced water damage, it may even be necessary to replace roof sheeting. Curled shingles are a clear sign the roof needs attention. 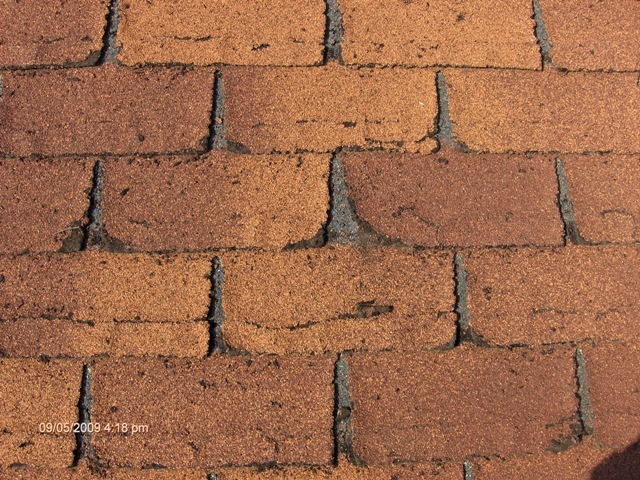 Curling shingles are a result of age and heat stress. Curled, brittle tabs will break off, exposing the felted asphalt surface, nails and shingle layers beneath. The whole tab may be cracked and ready to fall off. Secure shingle tabs back in place with waterproof roofing cement if deterioration is not too extensive. If tabs break off when attempting to cement them down, replace the shingle. Lift the shingles above with a thin pry tool, remove the nails, fill nail holes with roofing cement, and install a new shingle. Flashing around chimneys, vents, or along vertical walls on complex roofs may separate from constant expansion and contraction. Re-attach all flashing and re-nail. Seal the edges securely with roofing cement. Metal flashing on shingle roofs may be damaged by ice buildup, flying debris or rust and metal failure. Flashing in valleys may crack from metal fatigue caused by continuous expansion and contracting. Flashing may also be damaged easily by a mis-step of a careless workman or the owner himself. Reattach the flashing and caulk carefully. To replace flashing completely, lift adjacent shingles carefully in order to avoid breaking them. Minor holes or small cracks may be temporarily sealed with roofing cement. *Note: Because flashing is a high-stress roofing component, application of cement and sealants is a temporary repair at best; defective flashing should ideally be replaced . If leakage is occurring along the roof at vertical walls, check the flashing. Roof-to-wall flashing may not be high enough to avoid problems with a build-up of snow and ice, resulting in water backup under adjacent siding. Install taller flashings that reache higher up the vertical wall and ensure they are under any siding and caulked with sealant. Interior walls may display water stains if ice dams are forming at the roof edge, or if the roof edge is deteriorating. Inspect roof sheeting at the drip edges for failure by lifting shingles at the roof edge carefully. Check for discoloration and decay as above. Deterioration of sheeting along the drip edge suggests ice dams have been occurring, backing water up under the shingles. Water may be entering further up the roof. Trace the leak as above. If decayed roof sheeting is discovered, it must be replaced.. Test with a pen knife or small screwdriver. Replace soft, decayed sheeting. For build-up of ice and persistent roof-edge ice dam leaks, install more ventilation at the eaves into the attic space, and install a heat tracing cable at the edge of the roof. Ominous piles of granular materials in eaves troughs indicate shingles are weathering rapidly. 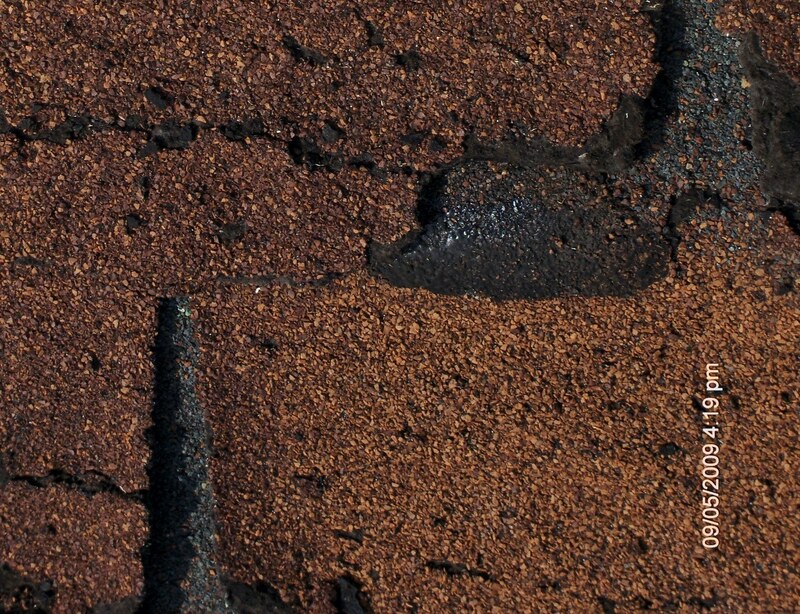 Granular materials on shingles protect the shingle, providing weight and protection against wind. Loss of granular exposes the felt-like asphalt surface to serious wind damage and ultimate failure. Apply roofing cement liberally to individual tabs that no longer have granular on them, or replace individual shingles as above. If the majority of shingles are affected, install a temporary repair such as roll roofing or a roofing membrane if necessary, but plan for a new roof. If eaves troughs and down-pipes are leaking, broken, or loose, reattach, repair and caulk them as required. with high quality caulking. Inspecting the Roof Yourself? If you are inspecting the roof yourself, use caution and care. Avoid stepping on curled shingles. Avoid breaking off shingle tabs if possible. If most of the shingles are already appear to be curled up, brittle or broken or missing, a complete replacement shingle roof will eventually be necessary. The roof is at the end of it's expected life. Plan for replacement as soon as possible. *CAUTION! * A fall from a roof can be fatal! Caution at all times is warranted. Secure ladders correctly, tying them off. Always extend the ladder above the roof edge high enough to ensure safe access to and from the roof. Stay off of the roof if it is windy or wet weather, or if there is ice and snow on the roof. Use approved safety gear, footwear and protective clothing. Most common roof problems with shingle roofs can be addressed by the average DIY'er or careful home owner with moderate do-it-yourself skill levels. You can do it!